U.S. Border Patrol agents near Tijuana, Mexico, faced a choice as they looked out over the chaos at a crowd of migrants that included rock-throwing men as well as barefoot children: Do they respond with force — and, if so, what kind? The circumstances at the San Ysidro border crossing Sunday were exceptional, but the question facing the agents was not. It's a split-second choice more often made in the remote desert, far from cameras, where agents are likely working alone and encountering groups of people crossing illegally. The agents' response — firing tear gas into the crowd — triggered widespread outrage and rekindled complaints that the Border Patrol, bolstered by President Donald Trump's tough talk, is too quick to use force, particularly when responding to people throwing rocks. But use of force by Customs and Border Protection officers and agents is declining from a high during the 2013 budget year, government statistics show. There are high-profile exceptions, like the shooting death by agents of a 19-year-old Guatemalan woman who crossed the border near Laredo in May. Still, experts say policies have improved following a major audit five years ago. "There has been progress made — especially in getting officers better training and better equipment," said Josiah Heyman, a professor with University of Texas at El Paso and director of the Center for Inter-American and Border Studies. "When I first started studying this, most agents had a gun and a baton. They didn't have the choice to use anything else." Firearms were used 45 times in budget year 2013 compared with 17 in 2017, according to data from Customs and Border Protection. For the first 11 months of the 2018 budget year, firearms were used 14 times. The data includes Border Patrol agents that patrol between the ports of entry, and officers who police border crossings. Over those 11 months, there were 743 cases of agents and officers using less-lethal force, like batons, stun guns, tear gas and pepper spray. These included 29 cases in which tear gas was used and 43 incidents of pepper spray. Though the final numbers are unavailable, those figures represent a drop from 2013, during the Obama administration, when there were 1,168 incidents of less-lethal force, including 27 instances of tear gas and 151 of pepper spray, according to the data. Less-lethal force has increased over the past two years but is still lower than 2013. Complaints about excessive force prompted Customs and Border Protection to commission an investigation by the Police Executive Research Forum, a policing research and policy group. The 2013 audit highlighted problems that included foot-patrol agents without access to less-lethal options. It recommended law enforcement not be allowed to use deadly force when people throw rocks — a suggestion that was rejected. 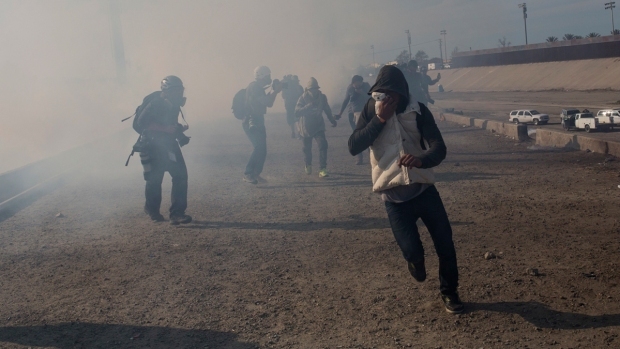 U.S. border agents fired tear gas on migrants protesting near the U.S.-Mexico border on Nov. 25. This is the timeline of events that led to the closure of the crossing. Following those reviews, Customs and Border Protection revised policies and made major changes to training. Agents now undergo scenario-based drills at the academy and learn how to de-escalate tense situations. They get 64 hours of on-the-job training on use of force. Some sectors, like El Paso, have a virtual reality simulator. The octagonal giant screens mounted on a platform mimic a desert encounter where agents must decide whether to fire their weapons. The scenario is designed to cause stress, and agents are forced to think quickly or face being shot, run over or hit with rocks. After the simulation, they discuss reactions with training officers and work on how to better respond in the future. "The desert is a very difficult, dangerous unstructured environment," said Aaron Hull, Border Patrol chief for the El Paso Sector. "We're trying to keep our agents safe. We're trying to protect the safety of our communities, and all the people involved." Chuck Wexler, head of the police research forum, credited the agency with taking the recommendations seriously. "Also when they do have an incident, they have a better review process," he said. Trump defended the use of tear gas on children — claiming it was "very safe," a "very minor form" of irritant. But Customs and Border Protection officials still plan to conduct a review to determine whether it was justified and what — if anything — could be done better, according to Commissioner Kevin McAleenan. Agents are authorized to use deadly force when there is reasonable belief that there is an imminent danger of serious physical injury or death to the officer or another person. They have discretion on how to deploy less-than-lethal force: It must be both "objectively reasonable and necessary in order to carry out law enforcement duties" — and used when other "empty hand" techniques are not sufficient to control disorderly or violent subjects. Officials say they deploy the lowest form of force necessary to take control of a situation — but critics of the Sunday clash say gas never should've been used near small children. The chaos began after a peaceful protest by some of the thousands of migrants marooned in Mexico. It was unusual in part because of the large number trying to cross illegally — officials said it was between 500 and 1,000. 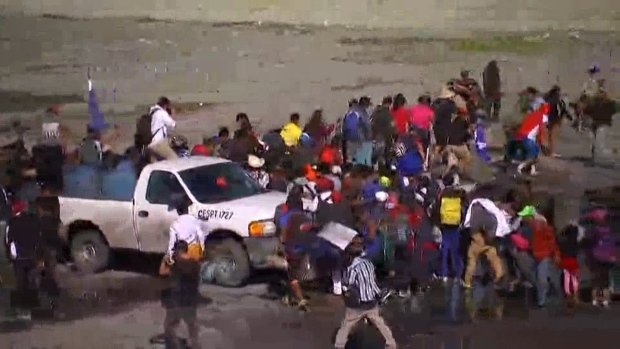 U.S. authorities shut down the nation's busiest border crossing for several hours. San Diego Border Patrol Sector chief Rodney Scott said 42 people were arrested and some children inhaled the tear gas, but they were not intended targets. But images of crying children in diapers and bare feet running from plumes of gas struck a nerve again — not unlike the images of weeping, frightened children who had been separated from their parents over the summer. "Any border security and immigration policy that results in mothers and children being gassed is not only cruel and morally reprehensible, but also an abject failure," said Rep. Bennie Thompson of Mississippi, the top Democrat on the House Committee on Homeland Security. "The administration should be preparing itself to finally face real oversight of its failed border and immigration policies."